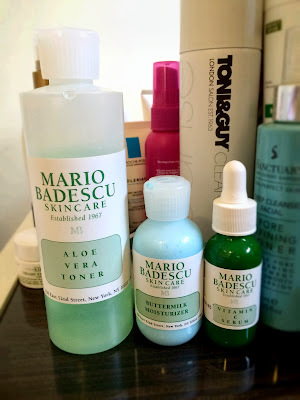 I was introduced to the Mario Badescu range by Abigail from The Shrinking Wallet about 12 months ago and since then, I've really incorporated the products into my everyday skincare regime. She introduced the Drying Lotion and the Healing Cream to me because I was having a lot of problems with break outs and I'm a little embarrased to say that I went out and bought them but... I barely used them because I'm super lazy. However, it really sparked my interest in the brand and I've since purchased 3 additional products. I went to Kit Cosmetics with the intention of only purchasing the toner but the sales assistants there are always so knowledgable and helpful that I couldn't help but buy the other 2 products as well. Buttermilk Moisturizer ($28.95): I picked this up because it was blue! It really caught my eye and it's meant to be good for my combination/sensitive skin. I did put off using it for ages though because I couldn't get my head around the blue colour and it freaked me out a little. When I got around to using it though, I found out that it's not quite hydrating enough for me and it also smells like grass. The annoying thing about the packaging for this (and the toner) is that it has a bit of a... pull up spout(?) where moisturiser can sometimes get clogged up in and dry up. Aloe Vera Toner ($22.95): I've been using this every morning and night and I'm not sure if it really does anything for me. I just felt like I had to have a toner in my skincare regime. This has no fragrances or alcohol which ticked all the boxes for me (it's so hard trying to find a toner that doesn't have those 2 ingredients!). I pour this onto a cotton pad and wipe it all over my face. It does leave a bit of a tingling sensation. Vitamin C Serum ($64.95): The sales assistant sold me on this when she said that all the staff at Kit Cosmetics swore by this. It's meant to brighten my complexion and I use it every other night. I've heard that Vitamin C serums are also good for fading acne scars but I'm not sure about this. It hasn't stopped me from slathering it on generously over acne scars though :P I've definitely seen an improvement in brightness on the days after I use the serum. I've really enjoyed using the Aloe Vera Toner and the Vitamin C serum so I'll definitely repurchase those. I wouldn't repurchase the moisturiser as it's quite expensive and not moisturising enough. What's your go to skincare item to help with breakouts and acne? What a bummer the moisturiser wasn't that effective. 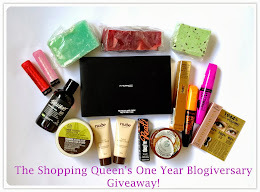 I would be hesitant too if colour was added into my skincare routine! The Vitamin C Serum sounds great! I would want a serum that brightens and combats my pesky acne scars. Shame about the moisturiser, I've used a blue moisturiser once before and I actually quite liked it.. 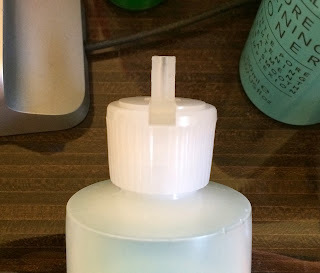 I think it was in the clean and clear range or a brand similar (long time ago). A little tip for the pop up spout dispenser, if it does get clogged a sterilised pin will help to clean it out, because the product becomes quite firm you can just pop the pin in, tilt it to the side and pull it out, should bring most of the gunk out of the opening with it. Definitely save your money. The moisturiser bottle is SO small and so pricey too! I've only tried a couple of their masks, which were excellent. They have a great skin care line. Glad you like it. I might invest in it now. haha Thanks.